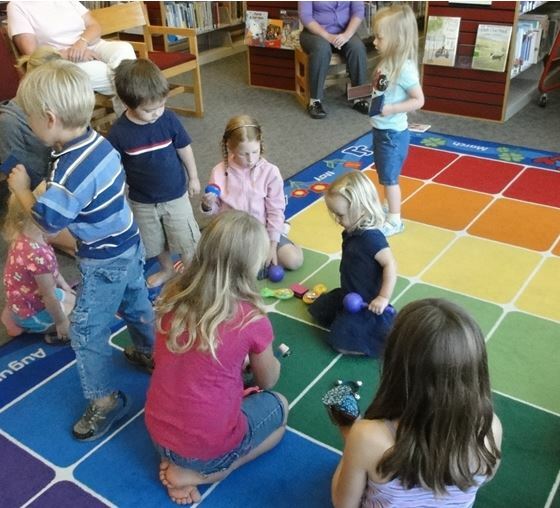 Kids select instruments for the playalong during a library storytime. When I applied for professional development funding to attend a Music Together Teacher Training, I identified three things I expected to learn: classroom management and lesson planning skills, new songs and activities for my baby/toddler storytime, and how Music Together’s curriculum supported early literacy. In Part 1 of this post series, I reflected on my first goal for the training and how it turned out. Today I’ll tackle the other two. 2. I wanted to learn some new songs and activities, especially for my baby/toddler storytime. I was really struggling to come up with appropriate activities for my baby/toddler storytime for kids age 0-3. I’d figured out what kinds of books worked with this age group (and that two was about their limit), but I’d been struggling with incorporating other activities into the storytime. Also, I repeated some of my activities, like “The Freeze” by Greg & Steve, every week. I needed some new ideas to freshen up my storytime! I haven’t been doing many storytimes this summer because of Summer Reading Program scheduling, but I’ve definitely incorporated some of my favorite activities into the storytimes I have been doing. Instead of handing out scarves for scarf activities, I toss the scarves into the air. The kids love reaching up to catch them as they float down. I’ve been trying to add a “playalong,” where I bring out musical instruments and let the kids (and parents) rock out while we listen to some music. It’s loud, but the kids love trying all the different instruments. I’ve also started singing the words “good bye” when all of the scarves/instruments go back in the box to make it easier for the kids to let go, and added a lullaby/snuggle time after our playalong to bring the energy level back down. I’ve tried using the “Hello Song” and the “Goodbye Song,” but my storytime parents are very shy singers and it hasn’t taken off yet. 3. I wanted to find out more about how Music Together’s curriculum supports early literacy and other forms of early learning. I live in a rural community with lots of at-risk kids. The local preschools only have capacity for 14% of the children in the county, and one local kindergarten teacher reports that about two thirds of her students are woefully underprepared when they start school. Kindergarten readiness (especially early literacy!) is our main goal as a community right now, and I wanted more ideas about how to incorporate early learning techniques into my storytimes and in some local planning initiatives. Like Every Child Ready to Read, Music Together emphasizes the importance of parent involvement in children’s learning. The Music Together techniques of encouraging parent participation during storytimes, providing take-home activities for families to do together, and sharing information about key early learning milestones with parents are all things children’s librarians can do to promote parent engagement and early learning. Plus, the similarity between the two programs helped me understand Every Child Ready to Read more thoroughly and gave me some great ideas about how to incorporate parent education into my storytimes. While working on one of my Music Together homework assignments, I realized that the Music Together curriculum would be a great way to encourage parents with low literacy skills to become active participants in their child’s early learning process. One of my coworkers had shared a story about a young mother she met at an outreach event who became very defensive when asked if she read to her son. She didn’t read–ever–and she refused to even consider opening a picture book. For parents who aren’t confident readers, coming to a storytime or engaging in early literacy activities might be intimidating. A music program, however, might be more appealing and would provide many of the same early learning benefits as a storytime. It would be great to apply for a grant to fund the site license fee and the purchase of materials so that the library could offer the program to at-risk families for free. My library is not able to offer that kind of program right now, but it’s something we might consider pursuing in a few years. Obviously, I found the training useful for all the reasons I’d anticipated. I wanted to end these posts, however, by talking about something that I didn’t expect from the training. I got to spend three very long days with other early childhood educators, music therapists, and music educators from all over Oregon. We were all there because we were passionate about children, learning, and music. During breaks and over lunch, we all talked about how the training was helping us think about our work in new and different ways. We shared ideas and anecdotes about our experiences. It was great to really connect with people from different regions and different types of early childhood programs, and their shared insights were valuable in ways that I hadn’t anticipated. I hope this information helped give you all a better picture of how a Music Together Teacher Training might benefit you as a children’s librarian! If you have any questions, please feel free to send me an e-mail at bmiller(at)crooklib(dot)org. Posted on August 21, 2013, in Libraries, Music, Music Together, Story Time and tagged Barratt Miller. Bookmark the permalink. 1 Comment.